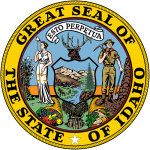 The 1980 United States Senate election in Idaho took place on November 4, 1980 alongside other elections to the United States Senate in other states as well as elections to the United States House of Representatives and various state and local elections. Incumbent Democratic U.S. Senator Frank Church ran for re-election to a fifth term, but was defeated by Republican Steve Symms. This page was last edited on 11 April 2019, at 04:02 (UTC).